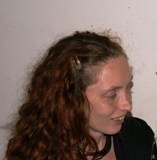 Jessamine O Connor lives in a train station in rural Sligo. Most recently her poems have been published in The Stony Thursday Book, New Irish Writing, The Stinging Fly, Shot Glass Journal and The First Cut. In 2011 she was the winner of both the iYeats and the Francis Ledwidge poetry awards. She was shortlisted for 2012 Bradshaw Books manuscript competition, and still has a book of poems itching to be published. You don’t go for the taxi. And gouge on the bed. Can’t leave it too late. Shut the curtains around us. And tear up the baby. One day short of two weeks over. That bloody roll yet? I spit. We can’t really say no. Deep into our soft damp ground. They whisper, licking our ears. But now there’s no need for words. Up and down the lunar tracks.